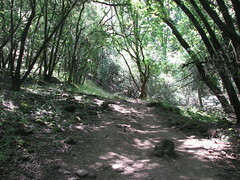 The next Sonoma County Trails Council trail work day to help repair the trails at Annadel State Park is Saturday, November 19, from 9am to about 1pm. Meet us at 9am at the bottom of North Burma Trail at Channel Drive. Look for the white SCTC tool trailer. We will have parking passes for those that drive and there should be adequate parking in that general area. Wear boots or sturdy shoes, bring water that you can take with you while working, and gloves. In order to make sure we have enough tools and snacks please let us know if you plan to attend. We look forward to seeing you all and having fun taking care of our wonderful park. Tagged: Annadel State Park, North Burma Trail, Trail Crew, trail stewardship, Volunteer!